Steve Hackett is at it again. With his 26th studio album At The Edge Of Light the ex-Genesis guitarist (and 26 albums in, should we even have to mention Genesis anymore?) this master-of-the-Les-Paul brings listeners flavors from all over the world, fantastic players, and some genuinely stunning songs. The instrumental “Fallen Walls and Pedestals,” opens, hitting one square between the eyes with its Middle-Eastern modalities and low string plodding. In the mix of these ten, we get commercial fun stuff like the popping bass, electric guitar jangle, and “oohs” of “Under the Eye of the Sun,” and the big sweet acoustic strum of “Hungry Years.” Then there are more prog offerings (with quite a big dose of orchestra) on songs like “Underground Railroad,” and dirty slide and harmonica on “These Golden Wings,” featuring a high rising chorus under Hackett’s distinctive vocals and acoustic plucking, then wild electric wailing. At The Edge Of Light ends with a dynamic trio. First the orchestrated instrumentals; “Descent” with Hackett riding distortion over heavy timpani and low strings and “Conflict,” a send-up of heavier guitar, drums, and driving strings. This last one features some of Hackett’s best guitar flights and flippery. Steve Hackett never just wails to wail, all his leads are purposeful and precise. “Peace,” is the very last tune with Hackett singing emotionally over a pretty piano. 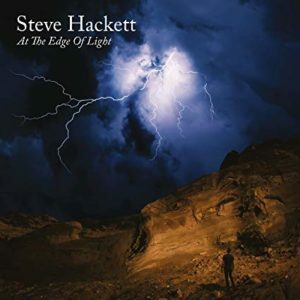 At The Edge of Light is another monumental achievement from Steve Hackett and if you haven’t yet listened to his output from the past few years, it’s about time you did.